M-100 Message Board - asked: Woodtype ?? A Hamburger friend bought the austrian 6.3 from Werner Mitteregger # 5721. Now is the question which wood was used. I know it is named "quilted", but which kind of wood is that ?? Does anybody know and can help. Mike Trei will know when he gets up tomorrow. Drew and I saw another German restored car with similar looking wood, probably done by the same guy. I'm going to guess maple, with a light brown tint or stain added. It certainly didn't come out of the factory looking like that. No that car seems to have ORIGINAL wood. I drove that car and it was in an perfect original condition, like new. The fotocar has a blue interior, but the driven car a green. I will advice him to get a copy of the datacard. The car I saw was the one with the green interior. Somewhere I have pictures. What makes you sure it's original, other than the word of the seller? In the picture you posted that shows the back of the glove box door, it looks like it has a glossy finish. Original Mercedes wood had a matt finish on the back of the door from 1967. I didn't take any word from a seller or buyer . The way the glovebox was made from one piece wood without any vineer, brought me to thoughts that it has to be original. But what you are thinking, that the backside of the glovebox was always without a glossy finish, I will check in my 600. I never noticed that the backface was different from the front. That glovebox is one piece of wood. The shown fotocar is an very early one with the chrome marking in the middle. That was original so. The one the Hamburger bought from Werner in Austria was a very late one # 5721 ! !, but I forgot to take foto's. The openingshandle was different. The shown foto has no openingshandle. Here is a early dasboard from a mirbach 6.3 with a "Plastic striping"
Autch, took the wrong picture. I think the 600 might have always had a polished back on the glovebox door. There is no way that that door in the picture is solid wood, just a very nice veneering job. For starters, the front face is quilted, while the back is birdseye, so they come from completely different parts of the tree. The car is a later one with the early style chrome strip added during the wood restoration. Note that it has the plastic tray with power window switches, and a gear lever with park at the top. I also think it's interesting that the car has a stereo radio, but no stereo speaker setup (at least up front). That chrome striping does not match with the windowswitches in the blue interior. The metal strip (aluminum, not actually chrome) was used from the start of W108/109 until 1967, but never on a 6.3. The plastic strip was then used until mid 1969 when they changed to the no strip version. Here is one of the original factory press photos from the 6.3 launch in 1968.
quilted Honduran Mahogany ..... ???? The difference you noticed on the foto between the front and the backside, was not in the green car. That one has the same front and backside. May the the flashlight made it seem different while taken from a different angle. W108/109 cars came with three types of wood. 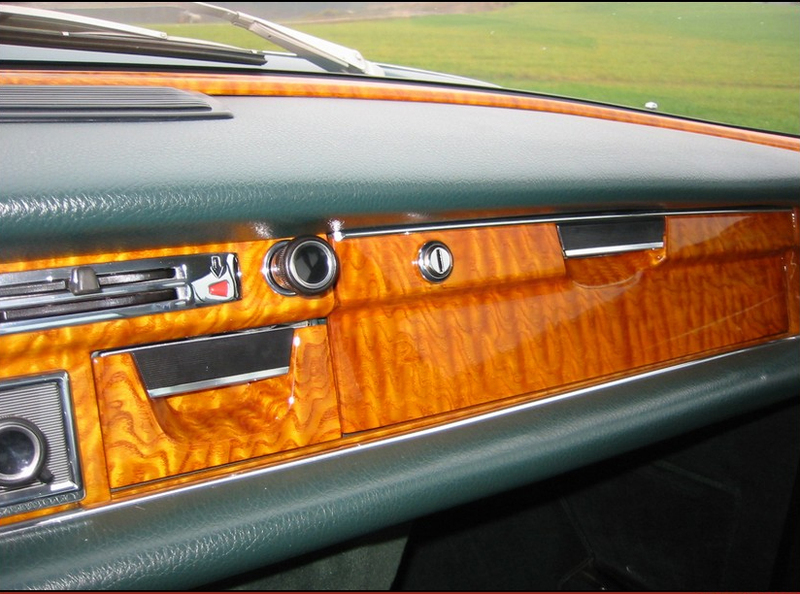 All W108s and those W109s with blue interiors had a light brown French walnut with a pretty smooth grain. Other W109s with non blue interiors had either burl walnut or Macassar ebony. As with everything else, I suppose anything was possible with a special order, although I am usually suspicious of such explanations. Mike, I usualy are as suspicious as you, me be a bit extra more, but in this case I was so impressed by that car's orginality I can't imagin it is not factory delivered. Better: I am totaly convinced it was. Here's the green interior with similar wood. Mike, that's the car I drove. Marvelous technical feeling, so good ! It is now clear, that that woodtype is defenitly AHORN, about ten times build in on special Kundenwunsch. This page was generated in 0.56 seconds.